GeoVelo is a great French cycling route finder. At the moment it only works in the city of Tours but there are plans to take it nationwide. The site lets you choose a starting and finish address and lets you decide if you want to see the quickest or the safest route.The cycling route is then shown on Google Maps alongside information about the distance and estimated time of the ride. The line of the route shown on the map has different colours depending on whether the route at that point is along a cycle path, a low traffic road or a road with heavy traffic. One really nice touch on this map is that bike repair shops can also be viewed. Utagawa VTT - This site lists more than 900 mountain biking routes. 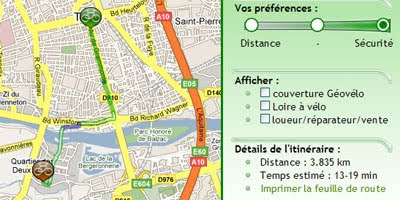 RouteYou - Community map site for walking biking, motoring and touring routes. Bikemap.net - 40,000 Bike routes mapped!